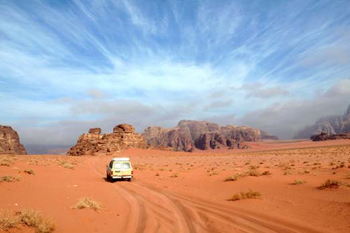 From Wadi Rum You and your guide to visit the Nabataean Temple, an impressive ruin featuring 2000 year old Kufic rock art. After leaving the Nabataean Temple you will stop at Al Shallaleh, before continuing on to Lawrence Spring. Then you'll move on to see the Map. After the Map, your guide will drive you to the Sand Dunes, which are a large group of sand dunes that have piled up against the mountains. It's a lot of fun to climb to the top, snap some pictures, and then race down. The next thing you'll go to see is the Ancient Inscriptions. After viewing the inscriptions left by ancient trade caravans, you will go to Lawrence House. Following this you'll go to Burdah Mountain where you can marvel at the large natural rock bridge from the ground. Next you'll go to Um Frouth Rock Bridge, which you will have a chance to climb. Next we'll take you to the Small Arch where you can climb for a little while before heading to Khazali Canyon. Here you can walk inside to see the inscriptions. Then you'll go to the camp, where you can put your things in your tent, take a shower, and sip Bedouin tea before viewing the gorgeous setting sun from an ideal viewing spot near camp. After sunset you can enjoy a delicious Bedouin dinner plus Bedouin songs and music before retiring to your tent.